The ultimate purpose of digital marketing is to generate revenue through various online activities like social media, reputation management, search engine optimization, search engine management. Webmasters are striving for greatness whenever it comes to digital success. Constant evolution through experiments and experiences are the key factors behind any digital success. 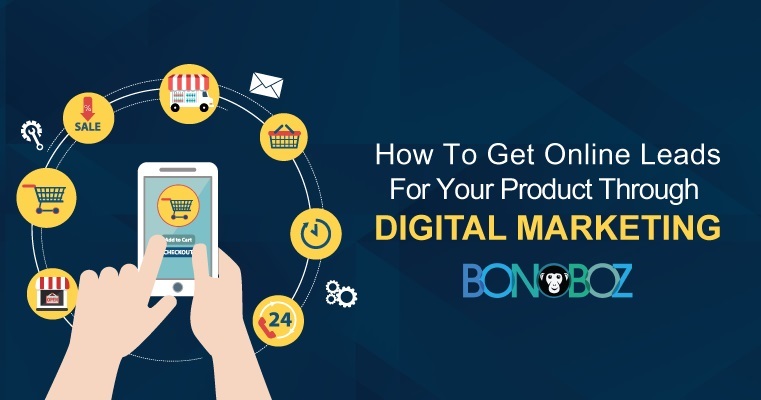 So, today we will discuss, how to get online leads for your product through digital marketing. With that being said, you cannot ignore that people who come to your website are not having a mindset of a buyer. According to a fact, only 4% of the people are want to buy something rest 96% are just surfing the Internet and getting the information. However, according to the Salesforce, companies that are brilliant in the field of quality lead generation are successful in generating 50% more sales at more than 30% lower investment. So how do they getting more quality leads and eventually making more revenue? We, at Bonoboz, have a profound experience of each channel to generate leads. Here’re quick points that we always follow to run a successful lead generation campaign. As one of the proficient digital marketing agency of Ahmedabad and Gujarat, we believe that social media can be the best lead generation platform for your clients and business. If used smartly, you can have amazing results through the social media marketing itself. Facebook, Instagram, Twitter, LinkedIn, Pinterest are very famous and most revenue generating social media platforms for startups. Among them, Facebook is successful in giving us results. Based on your niche, products, service, and industry you have to choose which social media platform works perfectly for you. According to Sprout Social, we are currently living in an era where 40% of the population spend more time on social media and the internet. Hence, it is needless to say that social media is the best area where you would get more and new customers easily. It has also been stated that compared to outbound marketing, social media has 100% lead generation-to-close rate, said by business2community. Whenever we began digital marketing for any of our clients, we always do a rigorous research that allows us to have an in-depth analysis and data that help us to create a roadmap for the campaigning. Then we choose how we should move forward. Based on the products and service we decide channel, determine the budget, create ads, and so on so forth. However, you must not avoid the power of search engine optimization. SEO is the benediction that gives you organic traffic without investing a penny. If you own a website for your business, search engine optimization is the must-have activity. More than 80% percent buyers surf the web before buying a particular product. This statistic shows what is the importance of the internet in the lives of people. Since Google is the best website and search engine of the world, people always go to Google. According to wishpond, Google has 192 million unique visitors and over 1 million advertisers uses Google Adwords and Google Adsense which shows the power and impact of Google in the market of Digital Marketing. It would be profitable if you integrate search engine marketing and search engine optimization in your campaigning. Now please note that this would work differently for different startups. With that being said based on your products and services you can have a search engine marketing campaign to increase, sales, install apps, make purchases, fill forms or generating leads for newsletters. Since the evolution of social media marketing, email marketing has been least considered channel to reach out to the customers. Through email marketing, you are getting a direct the opportunity of getting in direct touch to your old customers and also build a new customer list. In social media and search engine marketing, you may have to pay for the impression you get from your ads and your ad may not get the full opportunity as through email marketing. Because email is a direct communication channel, unlike social media. In social media people may or may not read posts while an email can give the opportunity to connect with your customers directly. Through email marketing, you can make announcements very quickly. You can broadcast offers, discounts, let people know about your new product launch, etc. If you have a real database, the potential of email marketing exceeds each of other channels.